Introduction Managing internal carotid artery (ICA) injury during extended endoscopic transsphenoidal surgery is an extreme challenge. We aimed to find a possible surgical treatment strategy. 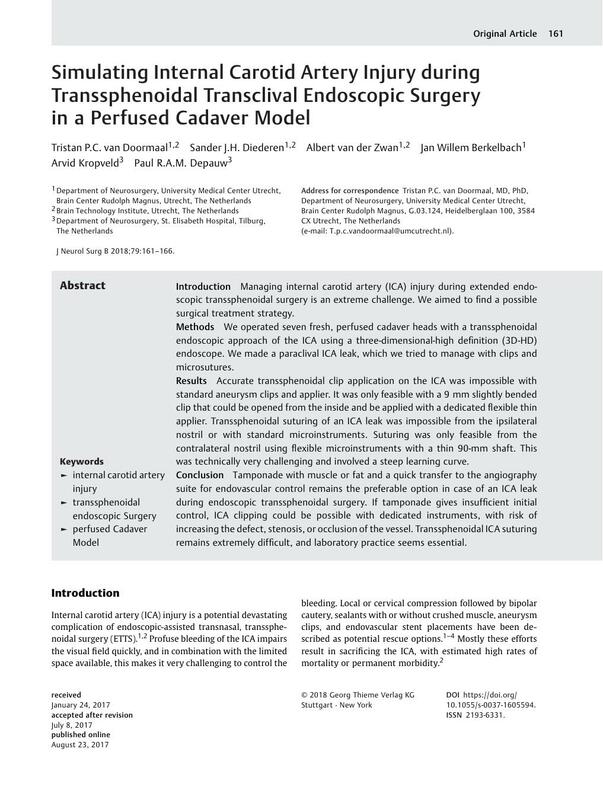 Methods We operated seven fresh, perfused cadaver heads with a transsphenoidal endoscopic approach of the ICA using a three-dimensional-high definition (3D-HD) endoscope. We made a paraclival ICA leak, which we tried to manage with clips and microsutures. Results Accurate transsphenoidal clip application on the ICA was impossible with standard aneurysm clips and applier. It was only feasible with a 9 mm slightly bended clip that could be opened from the inside and be applied with a dedicated flexible thin applier. Transsphenoidal suturing of an ICA leak was impossible from the ipsilateral nostril or with standard microinstruments. Suturing was only feasible from the contralateral nostril using flexible microinstruments with a thin 90-mm shaft. This was technically very challenging and involved a steep learning curve. Conclusion Tamponade with muscle or fat and a quick transfer to the angiography suite for endovascular control remains the preferable option in case of an ICA leak during endoscopic transsphenoidal surgery. If tamponade gives insufficient initial control, ICA clipping could be possible with dedicated instruments, with risk of increasing the defect, stenosis, or occlusion of the vessel. Transsphenoidal ICA suturing remains extremely difficult, and laboratory practice seems essential.